Find out what Nina and Tom are doing when they aren't making shirts. 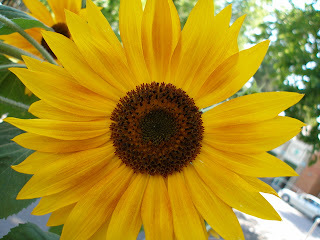 Hello To All. Well summer is here for The Monkey (school ended last Thursday). And The Bubby will be finished with his sophomore year of high school at the end of this week. There was an end of the year potluck at The Monkey's school so I thought I'd put a twist on cupcakes I agreed to bring. I found this fun recipe in one of my baking books . I altered it just a tad and it came out great and the kids and parents loved them. These are so fun. Note: To melt the chocolate, place in a double boiler over simmering water on low heat for approximately 5–10 minutes. Stir occasionally until completely smooth and no pieces of chocolate remain. Remove from the heat and let cool to lukewarm 5–10 minutes. In a small bowl put flour aside. In a large bowl, on the medium speed of an electric mixer, cream the butter until smooth. Add the sugars and beat until fluffy, about 3 minutes. Add the eggs, one at a time, beating well after each addition. Add the chocolate, mixing until well incorporated. Add the dry ingredients in three parts, alternating with the half and half milk and vanilla. With each addition, beat until the ingredients are incorporated, but do not over beat. After mixing pour bag of chocolate chips and mix in with spoon. Using a rubber spatula, scrape down the batter in the bowl to make sure the ingredients are well blended and the batter is smooth. Carefully spoon the batter into flat bottom ice cream cones, filling them to the top of the cone. 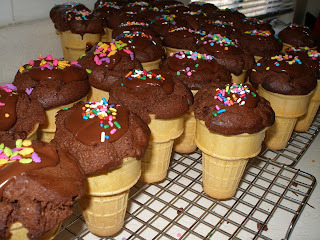 Still using the cupcake pans (or muffin tins) place one cone in each hole. Bake for 20–25 minutes, or until a cake tester inserted in the center of the cupcake comes out clean. Be careful when pulling pans out and placing them on the cooling rack. Some cupcakes may get lopsided and may fall over. Cool the cupcakes for 20 minutes and make Glaze Topping. Makes a little over a dozen. If you have any questions, comments or suggestions, let me know. 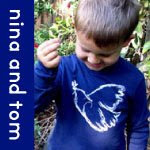 Find Out What Is Happening at Nina and Tom, Get Discount Codes and Other Special Deals With Our Newsletters. Join Our Mailing List Today and You'll Be Entered to Win a Free T-shirt.